I followed the advice of another (whose beautiful purse I can not for the life of me find the link to. UPDATE: Big thanks to Diane, who reminded me it was TraceyJay’s purse that I had seen. It’s here.) But she (TraceyJay) is the one who told me about where to find the pattern. You know who you are (maybe?) and I’d love to look at your bag again….) and sewed around each petal before I assembled the bag. (Wow- that sentence was full of parenthetical statements! Did you follow all that?) Wonder Under is wonderful, but it wasn’t going to hold all of those on. 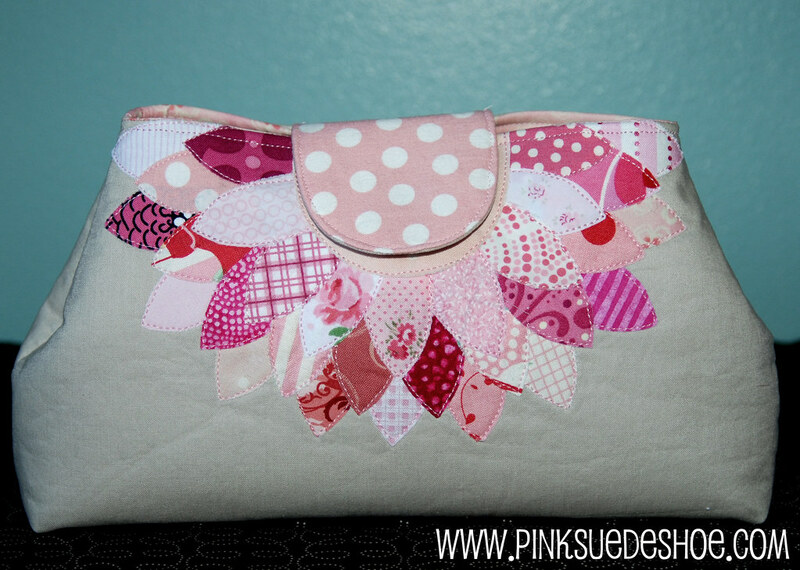 (And if I made this again I think I’ll just use a gluestick to attach them to the bag and then topstitch. Peeling the paper backing off of all of those little pieces was a nightmare.) Other than that it was a very simple little project which I didn’t start until 10 last night. This was my first adventure with a magnetic clasp and it went off without a hitch, easy peasy. Cute lining, no? I found it on sale for 50% off. I love that. The only other modification I made to the pattern was the interfacing. I didn’t have any regular interfacing (really?) so I used fusible fleece. I think it worked just fine. I’ll be making this little bag again, and next time for me. And when I do I’ll add a pocket inside. Come back on Monday and enter my giveaway to win this little cutie plus a bunch of other pink things. And then come back again on Wednesday for some serious pink party action. I’m adding this to Sew&Tell at Amy’s. Go visit, as always it makes for a wonderful morning/afternoon/evening/midnight snack. I really love that clutch! Congratulations! this is so cute and the sewing looks so perfect. I am glad to hear your success with the magnetic closure, as I’ve had some for a while and haven’t used them yet. This is sooooooo CUTE! 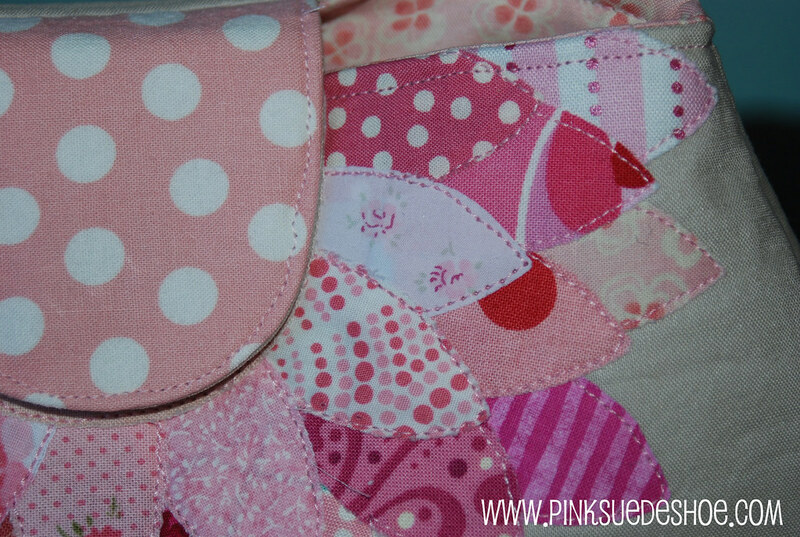 I love all the different pink fabrics you have used. Never heard of National Pink Day…but I sure will celebrate! I love your clutch. I used exactly those same leaves surrounding hearts on an applique quilt. Lovely! 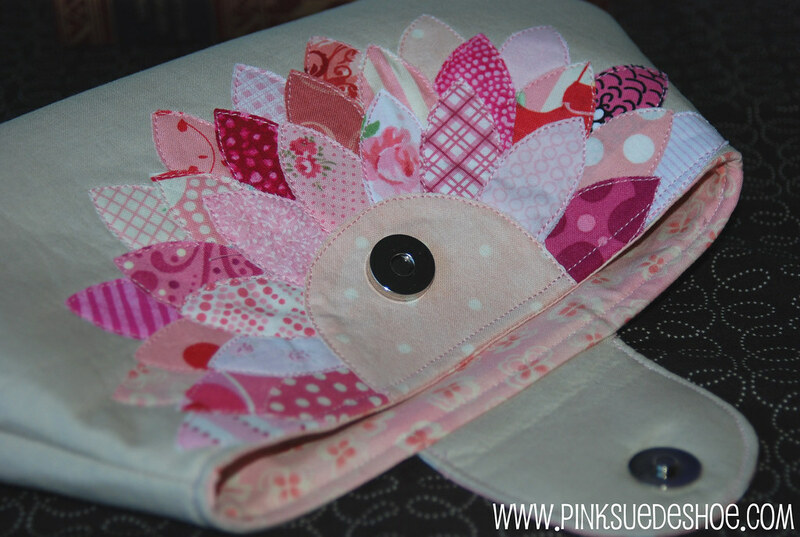 Terrific clutch…I just love the pink flower petals! I love it. Bring on pink week!! Your bag is so gorgeous. Love all those pinks. Looking forward to your pink week. This is so pretty! I love the shape of this clutch too! Okay, you are NOT giving that away?!!!!! Really, you are? Well, if you must, I promise to return on Monday in the hopes of scooping it up so I don’t have to peel all that paper off petals and make one myself….cuz it’s that pattern that made me buy the magazine in the first place! You’ve done a beautiful job on it. I love magnetic clasps until I try to topstitch in their vicinity and my presser foot gets stuck to them. You are so talented! That clutch is adorable! I keep thinking of what i’d coordinate it with! The possibilities are endless. I want it. I think I need it. It is consuming my mind. I love it, so pretty! And magnetic closures really are a snap, aren’t they!? I did my first a few weeks back, and they’re so easy. I love this little clutch and I can’t believe how quickly it went together for you. I’m still waiting on my copy of that magzine to be sent to me. I’ve got to say I’m a bit of a pink girl and I too would’ve had fun picking out all those fabrics! Yum! What a fabulous clutch! And such a great idea – National Pink Day! Pink!!!! Love all of those petals. And for the record, use Elmers washable gluestick all.the.time!!!! Oh my. This is so adorable!! PS I finally found that Kats place. A little bit crazy, but some serious potential! Remind me what you found there? I must google National Pink Day. It sounds like something Gabriela would want to celebrate! normally not a purse person, but this is so dang cute! great Finish! and impressive to get me that excited about a bag! Cute pink stuff!!! I think my PINK CAMERA is my favorite pink thing. It was supposed to be red but it is NOT. Too cute!!! Of course, you can never go wrong with pink! Congratulations on your anniversary..how fun that it coincides with pink day! Thanks for sharing!